Water is the critical factor in our lives. Without it, in a matter of days, our survival is challenged. All societies need it for various reasons, health, sanitation, agricultural production, energy and industry among many. But according to the United Nations report on water published in 2015, more than 2.9 billion people in 48 countries will face water shortages in the next 10 years. Water experts say it could destabilize and jeopardize the existence of some countries. Particularly with clean drinking water, the statistics are appalling. Three-quarters of a billion people on the planet lack access to clean water. Water-related disease kills around 840,000 people a year. Women and children are said to spend more than 140 million hours a day collecting usable water, which is often not from clean sources. What makes the United Nations report more alarming is the fact that by 2030, there will be a global water supply shortfall of 40%. This could pose a major threat to global security, something far more reaching in consequence than terrorism and other related problems. This has put researchers and inventors on their toes to try and look for a solution to this looming danger. VICI-Labs has collaborated with a team of researchers from the University of California, Berkeley, and the American National Peace Corps Association to develop a simple and cheap atmospheric water condenser known as WaterSeer. 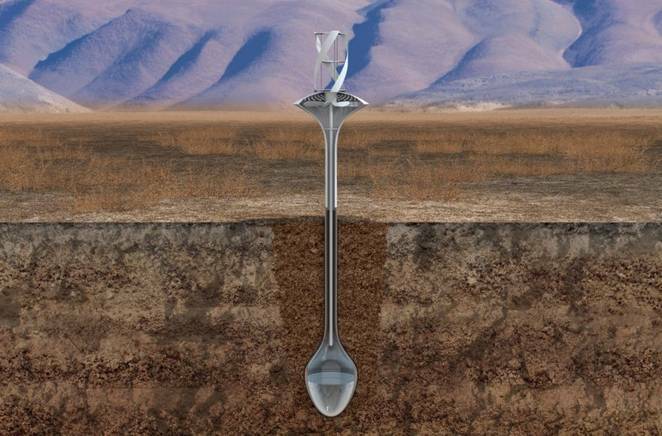 This development could help create adequate water for people around the world. The WaterSeer is a very simple device. It is designed to operate without an external power input, and without the need for costly chemicals or maintenance. 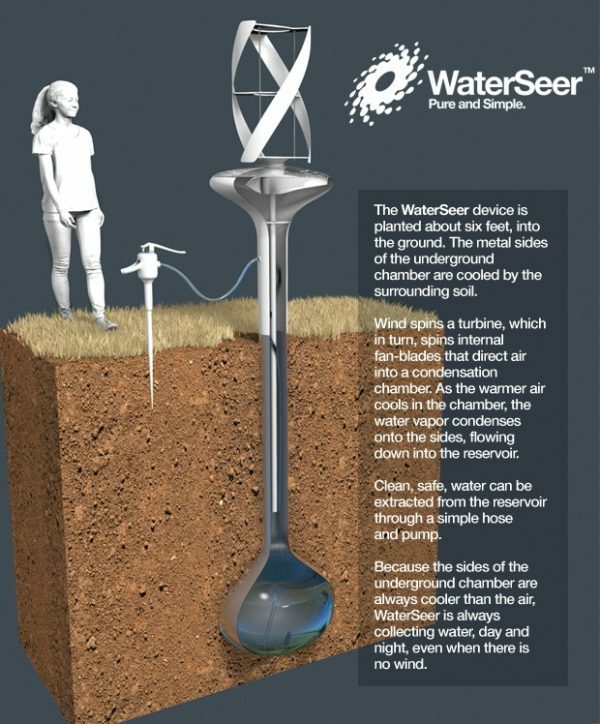 It collects moisture from thin air and condenses it into water using the temperature difference between the above-ground turbine and the collection chamber, which is installed six feet underground. The above-ground turbine spins in the breeze, turning internal fan blades and sending air down into a condensation chamber, where the air is naturally cooled by the surrounding earth. This process causes the water vapor to condense into liquid water that flows into a reservoir below. The potable water can then be delivered to the surface via a simple pump and hose. According to the manufacturers, the WaterSeer is capable of producing up to 11 gallons of clean drinking water per day. It can function anywhere in the world, including arid regions where water is extremely scarce. The manufacturers have successfully tested the first prototype at the University of California's Gill Tract Farm in Berkeley. According to the manufacturers, they hope to start producing the device in bulk by early 2017. The WaterSeer will not be expensive. Currently, the manufacturers are seeking crowdfunding to underwrite the field-testing and to generate pre-orders that will fuel the WaterSeer 'buy one give one' model, which will see a device go to a family in the developing world for each one purchased. Backers at the $134 level will be able to reserve a WaterSeer unit of their own, which will be fulfilled once production begins. This means with only $134, you will be able to get this wonderful device, to generate clean and safe drinking water, for you and your family. You can click here to help the production of the WaterSeer device. This article originally featured on AnonHQ.com and Treehugger.com.